German engineers hook a kite to a train and generate power. 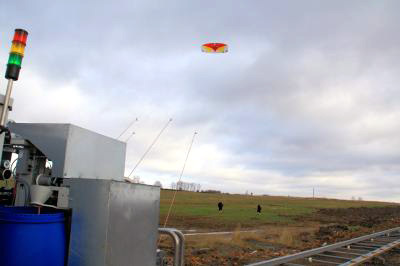 A kite makes its maiden voyage at the test site in Mecklenburg-West Pomerania. (Inside Science) -- The simplest phenomena can be harnessed to create electricity -- even a kite blowing in the wind. Engineers in Germany have devised a system using stunt kites, the kind that people use to provide lift when jumping off cliffs and buildings, to do just that. These kites are unmanned and don't yet produce large amounts of electricity, but the researchers are ramping up. The American cartoonist Rube Goldberg, who designed extraordinarily complex gadgets to perform simple tasks, would probably be impressed. The idea came from a wind energy company, NTS GmbH in Berlin, which took it to the Fraunhofer Institute for Manufacturing Engineering and Automation IPA in Stuttgart. The theory is that wind blowing at the surface is unreliable and usually negligible, but at higher elevations, it becomes stronger and more consistent. At around 300 feet, wind speeds average 50 mph, and get even stronger a bit higher. The common wind turbine’s rotor tips are about 600 feet up. According to Joachim Montnacher, an IPA engineer, their kites fly at 1,000 feet so the energy produced far exceeds that produced by a wind turbine. Wind also is steadier the higher you go, Montnacher said. At 30 feet there is only a 35 percent chance of wind speeds hitting 15 feet a second (about 10 mph), but when you get to 1,600 feet that likelihood goes up to 70 percent. The wind transfers mechanical energy to the kites, but how do you turn that into electricity? That's where Rube Goldberg fits in: You connect it to a train. Montnacher said that 2,300 foot long cables run from the kites to a vehicle on rails. The motion of the kites pulls the vehicle and that motion is connected to a generator. "At the moment, we have one vehicle on a straight line, 400 meters (1,300 feet) for testing," Montnacher said. "Next year we want to construct a closed loop with two lines at 400 meters with curves at each end." The generator hooked up now can produce 100 kw of power, typically enough to satisfy the demands of several average homes. But "the test output is smaller," Montnacher said. The most difficult part may be controlling the kites. The cables are attached to a winching mechanism. A control unit on the vehicle measures the activity and sends signals to the kite sending it into either a figure eight or a sine wave path, an oscillating curve. That means a kite measuring just 65 square feet creates a pulling power measured at 10 kilonewtons, or enough to move more than one ton. A collection of kites with just under 1,000 square feet should be able to produce the same amount of electricity as 20 one-megawatt wind turbines. Each unit would take up the same space as the turbines, but without towers. Another advantage is that the system would work almost anywhere. Current turbines need to be placed where the wind is strong, constant, and low. In the current test, the engineers are using a remote control device, similar to what pilots of model planes use, to control the kites and turn them into the wind. Eventually, computers will take over. The main goal, according to NTS GmbH's Guido Lütsch, would be a complex of 24 kites that would generate 120 gigawatt hours a year. That would replace 30 turbines and supply power to 30,000 homes. "I guess it would work," said Revis James, director of generation R&D for the Electric Power Research Institute in Washington. But James raised two concerns about the approach. First, that using kites to generate electricity could be inconsistent and require a backup system. Additionally, energy could be lost in two transitions, from kite to vehicle and in turning the vehicle's mechanical energy into electrical energy. "Hard to believe that those two steps are as efficient as a fixed turbine generator," said James. Montnacher said they will need two more years to produce a commercial version but already have investors.